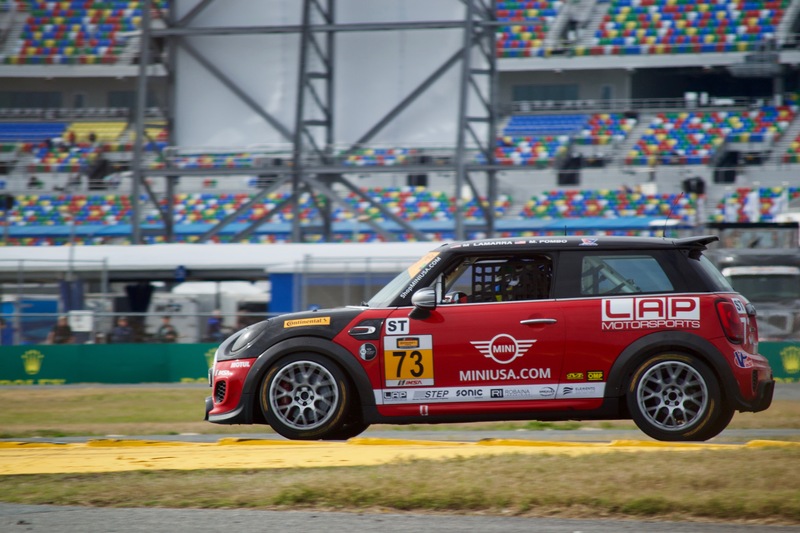 After a successful Roar and excellent qualifying session, the MINI JCW Team was confident that they had a chance of repeating last season’s historic victory at Daytona International Speedway. Nate Norenberg was the top qualifier for the team in the 37. He briefly held the pole position before being bumped to second by the 81 BMW, whom happened to be drafting off of him. The team’s strategy for the four-hour BMW Endurance Challenge, was to allow the competition to control the first three hours of the race, and then seize control for the final deciding hour and bring home another Daytona trophy. For the first hour things were going exactly as planned. The competitors were kept within reach and the drivers put in consistent laps. But as the first hour wound down, Mike LaMarra experienced a failure with the right front axle in the 73, forcing him to pit for repairs. As the race continued on, the MINIs started to move forward. Norenberg guided his MINI JCW to the front and was leading comfortably when suddenly the 37 experienced it’s own right front axle failure. With the 37 headed to the pits for repairs, the 52, which was shared by Tyler Stone, Jared Salinsky and Mark Pombo, inherited the lead. Unfortunately, the 52’s time up front was short-lived as the car sustained radiator damage as a result of debris from an accident that occurred in front of them. 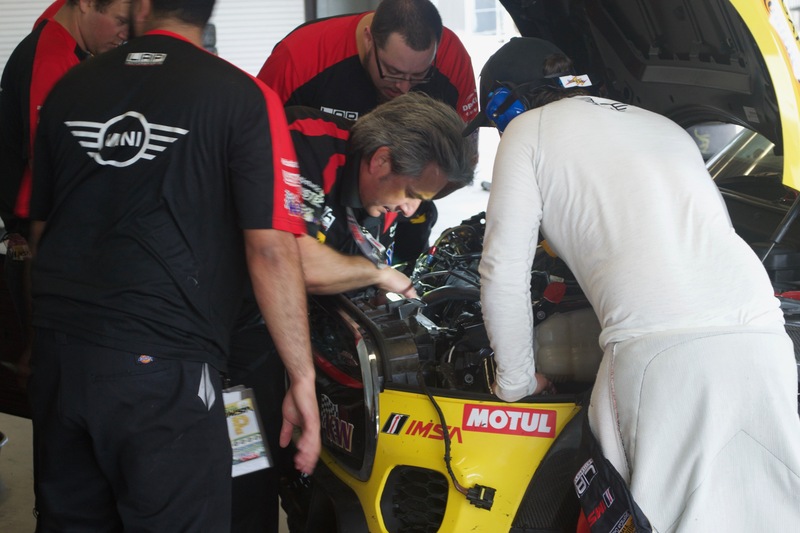 Team owner Luis Perocarpi and crew work on repairing the 52. The LAP Motorsports crew was amazing throughout the weekend. In addition to flawless pitstops the team of six technicians from Tom Bush MINI and Orlando MINI killed it in the garage, replacing both axles and the damaged radiator to return all three MINIs to the track. This is especially impressive considering at one point they were simultaneously replacing the broken axel on the 37 and the radiator of the 52. While the 52 would eventually succumb to overheating, the 73 with Mat Pombo behind the wheel would go on to complete its fastest lap of the race, a testament to the amazing work done by the crew. The team is extremely thankful to MINI of Daytona Beach, Tom Bush MINI and Orlando MINI for their hospitality and support. The MINI JCW Team will now focus their attention on preparing the cars for the March 16th race at Sebring International Raceway.